Sign: "Honk If You're Wearing a Thong!" Everyone Else: "No, Thank You." A naughty-minded electronic sign may have led some commuters to question their choice of undergarment. "Honk if you're wearing a thong!" the sign brightly encouraged drivers along MacArthur Boulevard in Cabin John, Md. "My day can only get worse after seeing this," wrote Chris Peabody of Bethesda when he sent us the photos above. He snapped them near MacArthur's intersection with 75th Place. 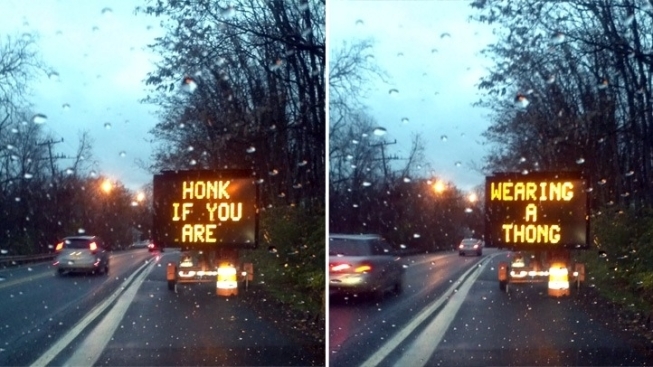 Initially, the Maryland Department of Transportation said the sign had been put up by a contractor, and was hacked. Fair enough. It happens. Usually those signs like to warn drivers there are zombies ahead -- and let's face it, if that really were the case, we would definitely like to be warned. However, it turns out that apparently, the sign was placed there by an anonymous benefactor. Montgomery County was going to fix the sign -- but it then realized the sign is actually "privately owned," and they have no idea who put it there. The county has taken it down since it's considered a public safety issue. Guess everyone will be keeping their underwear choices to themselves from now on. At least, we can hope.